Let's wrap up this series (which started here) with some miscellaneous features of console++. The console module, which console++ is built on top of, includes a handy command: the '=' command gives you access to Lua's dynamic.eval function; in other words it works as a simple expression calculator. Type '= ' then any mathematical expression and it will display the resulting value. 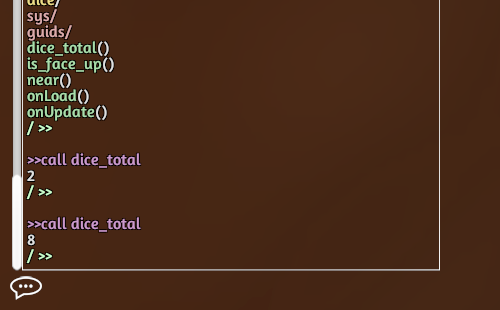 You can refer to any of the variables in your program when you are a table admin, but all players can use the '=' command for simple maths functions. Handy if your game is anything like Power Grid! 'echo' will print its parameter into the chat output (just for you); useful to include some output in a script you wish to 'exec' with the -q or -s parameters. 'cls' will clear the chat window. 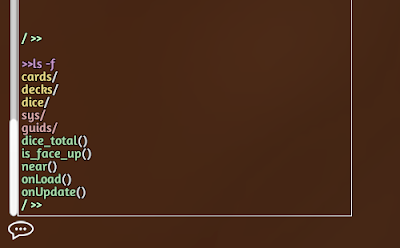 Finally, console++ gives all players a 'shout' command: this will broadcast its parameter as a message to all players, popping up at the top of their screen as well as in the chat log. It will appear in your player colour. I hope if you are using console++ that this series of posts has been helpful, or if you're not that it might have tempted you into trying it. Any feedback is greatly appreciated, especially bug reports. This will be the final installment of the tutorial series about console++ which began here. In this enthralling episode we'll look at the 'watch' command; a very useful debugging tool. 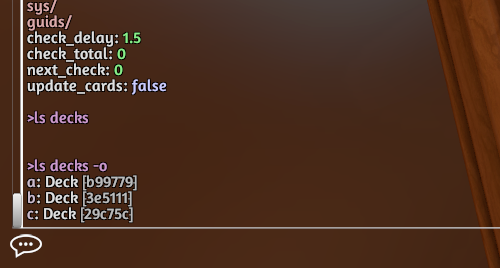 'watch' allows you to monitor a variable or object in your game (or even a function: more on that later), displaying a message in the chat window whenever it changes. Type 'watch /next_check'. Every two seconds the next_check variable will change and we'll see it do so. 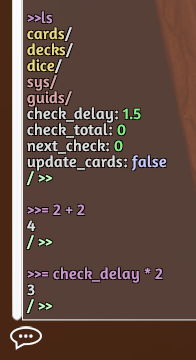 This is because we currently have check_delay set to 2 seconds; type 'fast' to change check_delay to 0.2, and you'll see the variable change every 0.2 seconds instead. Switch it back to 2 seconds with 'slow'. 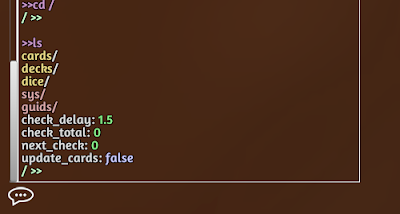 You wouldn't want this running after the point where you get the info you want; it's filling the chat window. To clear the watch list type 'watch -c'. The '-c' parameter clears the watch list if it's used on its own. You may instead supply it with a variable name to only clear that variable from the watch list: here we could have typed 'watch -c /next_check'. We can also watch objects: type 'watch /dice/d6' then roll the dice. You can see it will track the objects rotation and position. This is fine for an object which you have used in your program, but not all objects will be stored in a variable. 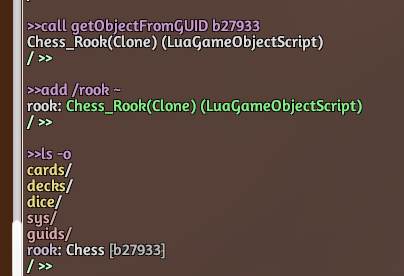 Happily we can also track objects via their GUID; right click the chess rook and in the scripting menu click on its GUID to copy it to the clipboard. Now type 'watch -g ' and hit ctrl-v to paste in the rook's GUID. Pick up the rook and move it around to see it being watched. You can also disable the watch list temporarily by pausing it with the '-p' parameter; this lets you stop the watch list outputting to the chat window without clearing it (and losing everything you are tracking). Try it now: type 'watch -p' and move the rook around; no updates! Do it again to unpause (use up-arrow to fetch the previous command). 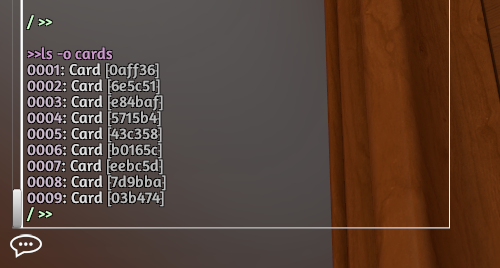 Grab the rook and move it around; the watch list really spams the chat window, since every tick the position changes. In a lot of cases this will be too much information, so the watch command allows you to throttle its output for each given item. Use the up-arrow key to fetch the command that added the rook to the watch list ('watch -g b27933', unless your GUID is different) and then add to the end of it '-t2'. This will add a 2 second throttle to the watch. Now drag the rook around and notice the difference. Notice also that this command has replaced the previous version of the item in the watch list, overwriting the old, unthrottled item; each variable or object may generally only appear once in the watch list. Now clear the watch list with 'watch -c'. 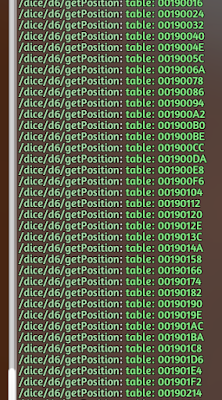 Clear the list, and then try to do the same for the dice's position with 'watch /dice/d6/getPosition'. Argh, what's happening here? 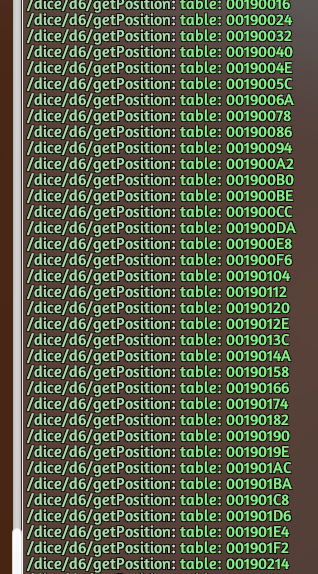 What is happening is that every tick the watch list is calling the getPosition function of the dice, and every tick it is getting a new table. Even though the table's member values are identical, the table itself is changing, so the watch list is outputting it each frame. This is definitely not useful! We can mitigate this by using the '-/' parameter; this parameter specifies a member of the returned table to watch, instead of the table itself. 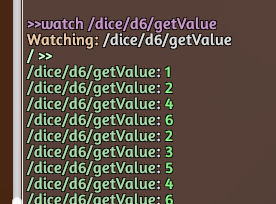 Type 'watch /dice/d6/getPosition -/x'; phew, the spam has stopped. 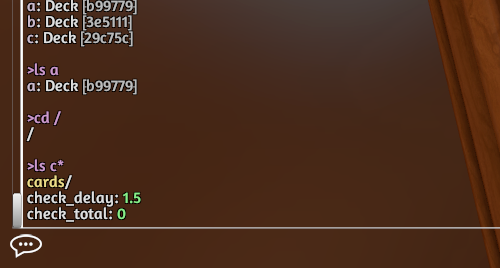 Move the dice around to see the 'x' value being tracked, then clear the watch list. As well as variables and objects, we can also watch functions. To test this out we'll need one so let's see what functions we have available with 'ls -f'. 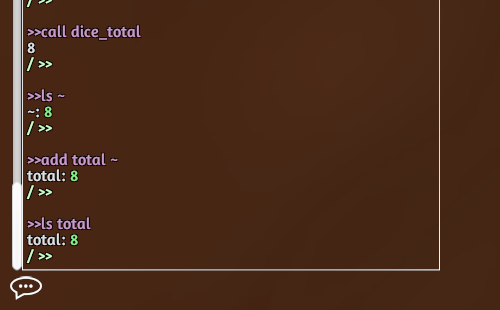 Ah: 'dice_total' is nice and simple as it has no parameters; lets watch it with 'watch /dice_total'. Roll the dice to see the function changing. We can also use functions with parameters; let's do that, but lets make things a little more complex, more like a situation you might find yourself in while actually debugging your mod. Not too complicated a function; it checks if two objects are near each other on the x and z axis. We're going to use it to check when the rook is near the d4. Our first problem is that we do not have a variable for the rook in our program; remember when we were watching it before we were doing so via its GUID. That's not an option here: the near function does not take a GUID as a parameter, it takes two object variables. Therefor the first thing we have to do is make one up for the rook. 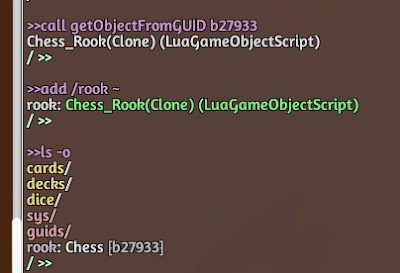 We'll do so using the 'call' command: type 'call getObjectFromGUID 'b27933'', and then 'add /rook ~'. (the '~' special variable holds the last result). Now we have a variable holding our rook we can use it as a parameter to the near function; type 'watch /near /dice/d4 /rook', and then pick up the rook and move it around, over the d4 and away from it. The near function is fairly simplistic, but I hope you can see how we can write debug functions in our code, and then hook them up to problematic objects during a play session, using them to work out what is going wrong with the mod. 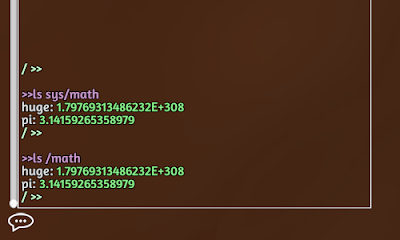 More persistently, if you know you want to track certain variables or objects you can add 'watch' commands to your console.autoexec, giving you feedback on events which you want to know happen (but which don't necessarily throw error messages) every time you play your mod. This continues the series which started here. You can see we are already in command mode (the command worked without a '>'), and are indeed inside the console table. This accomplishes the same thing: sets you to command mode and changes your current location. It was simpler to just type the console++ commands though, no? Setting up the autoexec has an additional benefit; we can invoke it manually using the 'exec' command. Type 'cd /' to return to the root table, then 'exec console/autoexec', then 'ls': you'll see we are back in the console table. Thus you can set up batches of instruction in strings in your program, and then run them with the 'exec' command; console.autoexec isn't special in this (it's only different because it is run automatically on loading) - any string variable can be executed. Double- and single-quotes (" and ') can be used to surround a parameter containing spaces in order to stop the spaces delimiting the parameter. The semi-colon (;) can be used to separate commands in a script instead of a new line. The command line sees the surrounding double-quotes and treats everything inside them as one parameter. It then sees that that parameter starts with a back-tick and so knows it is a string literal, and then the 'exec' command splits that string up by its semi-colons. We'll come back to 'exec' later; right now we're going to look at the 'alias' command. 'alias' allows you to create your own commands from any existing commands. At its simplest this simply lets you rename commands to suit yourself: console++'s 'ls' and 'dir' commands are actually the same command: one is simply an alias of the other. If you wanted to add your own name you can use 'alias' to do so. Let's say you are especially verbose, and you want to type 'list' instead of 'ls': simply enter 'alias list ls'. alias slow exec -q "`set /update_cards true; set /check_delay 2.0"
alias fast exec -q "`set /update_cards true; set /check_delay 0.2"
After entering these aliases we will have three new commands: 'slow', 'fast' and 'off'. 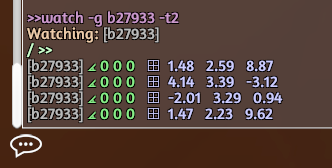 Typing 'slow' or 'fast' will enable the card display updating to match the dice total; one being more responsive than the other. Typing 'off' will disable the card updating. Try them out! The '-q' (quiet) option tells the 'exec' command not to display the result of each command it is executing; just to display the final result. If we used the '-s' (silent) option instead then the final result would also be suppressed. Alternatively we could have used the '-v' (verbose) option to make 'exec' display all the commands it is executing as well as their results. 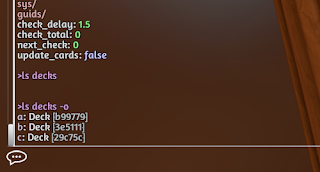 If you want to you can add your own custom output by using the 'echo' command, which prints its arguments in the chat window. Note we don't need a back-tick before true and false - these are special cases. If we were assigning a string we would need the back-tick, or it would try to look up the string as if it were a path. Now whenever you load your mod you will start in command mode, and have these commands at your disposal. Don't just jump in here: start at the beginning! 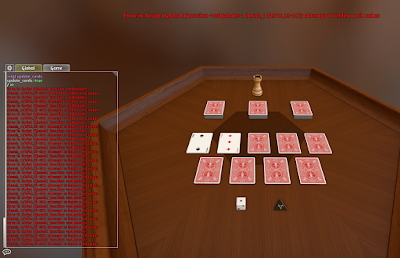 Once you've loaded the module in Tabletop Simulator remember to switch to the Game tab and turn on command mode with '>'. In the previous posts we've seen how we can display variables with 'ls' (or 'ls -v') and objects with 'ls -o'; the final option available is to display functions with 'ls -f'. Here you can see the functions defined in the example mod. We can do more than just display them, however; we can also call them. 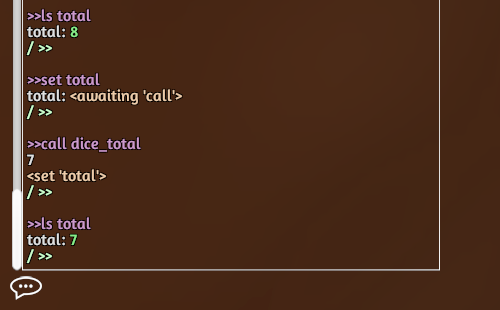 Type 'call dice_total', then roll the dice and call it again. We can pass parameters to functions just as you would expect, by adding them to the 'call' command. Let's use the is_face_up function on one of the cards. 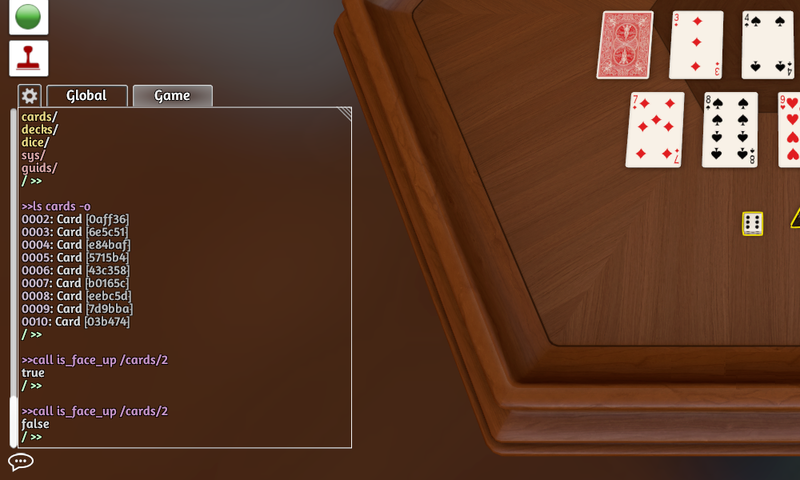 Remembers, the card objects are stores in the cards table; you can see them by typing 'ls -o cards'. 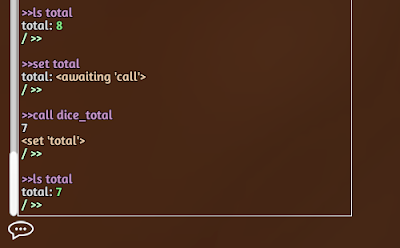 Type 'call is_face_up cards/2' to call is_face_up on the 2 card, then flip the card and issue the command again (use up-arrow to get the last command typed instead of typing it again). You can also create your own labels to hide things under by calling console.hide_globals in the mod's Lua code. Type 'ls' and you'll see that as well as the 'sys' label there's also a 'guids' label; if you look at the end of the GUIDS block in the Lua code you'll see the command that created it; whenever you call console.hide_globals it will scan for global variables/functions etc and hide them under the label you specify (provided they haven't already been hidden under another label). If you haven't read it then you should check out the first installment of this series, which goes over how to get set up. Last time we saw how to look at our program's structure. This time we'll see how we can manipulate it in real-time by changing and adding variables. First things first though; last time we were entering commands by typing the command symbol ('>') and then the command. Let's shortcut past that by entering command mode. 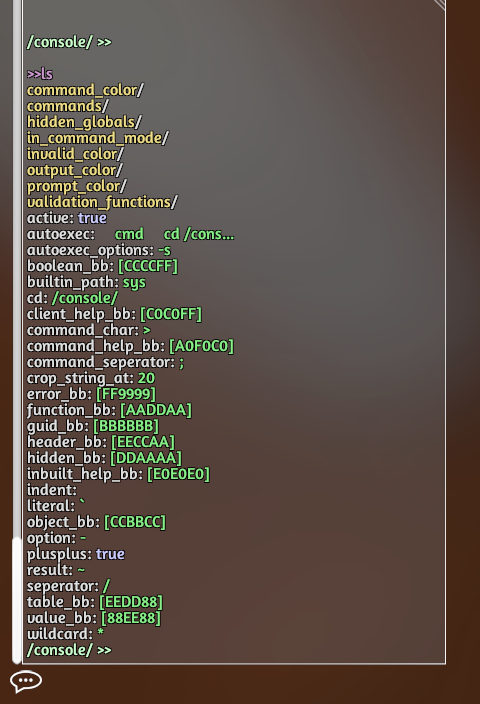 You can type '>cmd' at the prompt to enter command mode, and when in command mode you can type 'exit' to leave it. When you are in command mode the console will interpret all your inputs as commands, so you no longer need to prefix everything with '>'. After I entered command mode I typed 'cd cards' (just like last time), and you can see that while in command mode any commands you perform will end with a prompt which includes our current path. OK, so now we can simply type commands without a prefix, let's try a new one out: the 'tgl' (or 'toggle') command flips a boolean. Let's go back to the root table with 'cd /' then remind ourselves what is there with 'ls'. update_cards acts as a sentinel on the onUpdate event. Let's turn it on so the mod actually does what it's supposed to do. 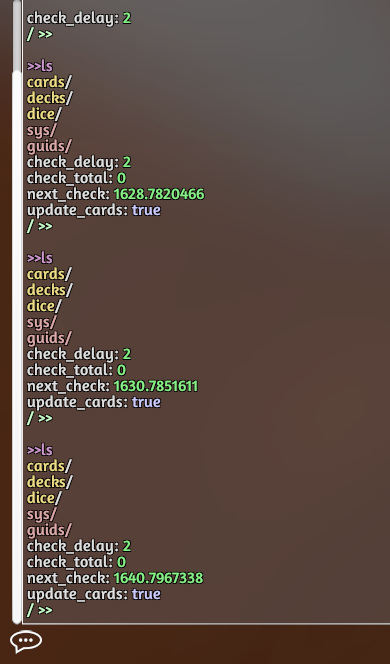 Type: 'tgl update_cards' and see what happens. Well, that isn't good. 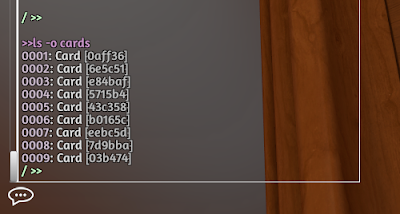 The mod clearly doesn't work right, and worse, because the bug is in the onUpdate event it is spamming errors every time it engages. Investigating will be impossible while the console is being filled with error messages, so turn it off again: in the console hit up-arrow to get the previous command and enter to execute it; this will toggle the update_cards boolean back off, disabling the faulty onUpdate event code. Note this technique; it's always a good idea to wrap timer-event driven code inside a boolean like this so that if things go wrong you can easily disable the code without aborting from the faulty session. So what's the problem? The error is on line 1542, so go to the global script in Atom and hit ctrl-g and enter 1542 to go to the offending line number. 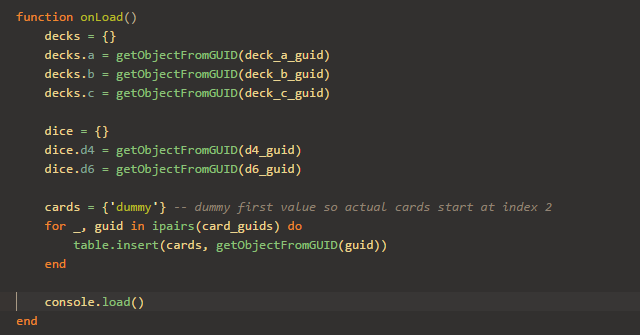 The Atom plugin will take into account any #includes in the code, and will take you to the correct line, which in this case is the one that reads 'cards[count].flip()'. The error is suggesting that we're trying to index a nil value, so either cards is nil, or the individual location of cards[count] is nil. 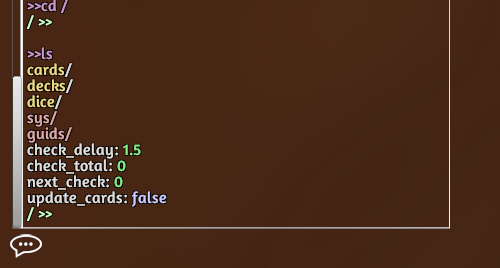 Let's have a look: type 'ls cards' at the console. Nothing? 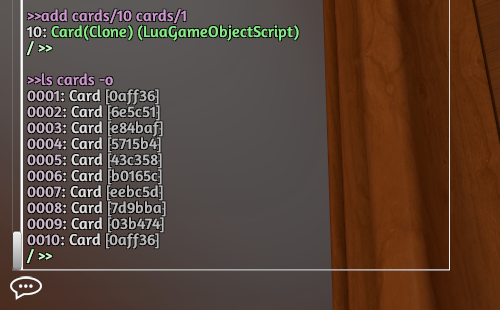 Oh, the cards are game objects; try 'ls -o cards'. There they are; cards is clearly not nil. Let's look again at the code - what is the cards table supposed to do? 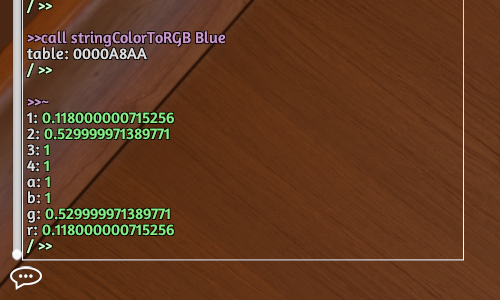 You can see in the onUpdate event it is looping over the numbers 2 to 10 - the card values on the table. 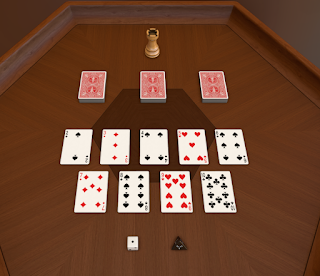 The table has been set up such that to access the 2 of Spades we use cards, to get the 3 of Diamonds we use cards, etc. In the onUpdate event we are looping over each of the cards from 2 to 10 and possibly flipping them. However, look at the 'ls' output: the cards are not indexed from 2 to 10, they are indexed from 1 to 9. Looks like the table has been set up wrong! There is no cards so when it tries to access it on the last iteration of the loop it doesn't find anything, thus the error message. Before we jump back into the code to try to track this down, let's confirm that that is the problem; we'll add a card at that index and see if the code works. To add a variable we use the 'add' command. We'll set it to the card that's not being looped over: cards. 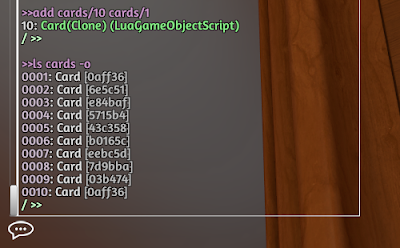 Type 'add cards/10 cards/1', and then 'ls cards' again. You can see it has a card at index 10, and it has the same GUID as the one in index 1. 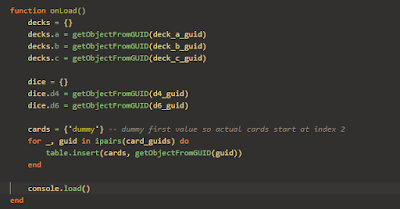 Turn on the code by toggling the boolean: 'tgl update_cards'. No errors - nice! 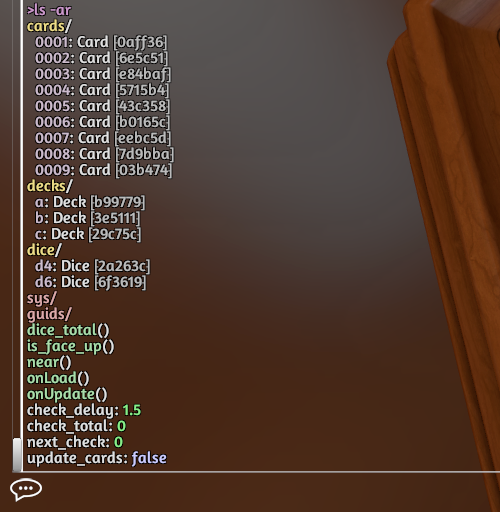 The update code is working, but our table is still set up wrong; all the indexes are off by one (as you can tell by the card 3 being face up, but the total of the dice only being 2). Select the dice and hit 'r' to roll them. The cards will update, but always to the wrong value. Toggle the update_cards variable to turn on the event code. 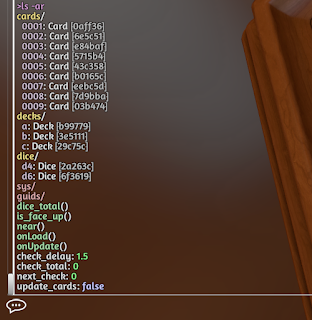 No errors, and the card being displayed matches the total of the dice! Select the dice and hit 'r' to roll them, and you can watch the cards flip to match. It feels a bit clunky though; the cards are updating very slowly. Type 'ls' again to see what variables we have to play with: sure enough, there's a 'check_delay' number set to 1.5 seconds. Let's set it to a shorter delay using the 'set' command. 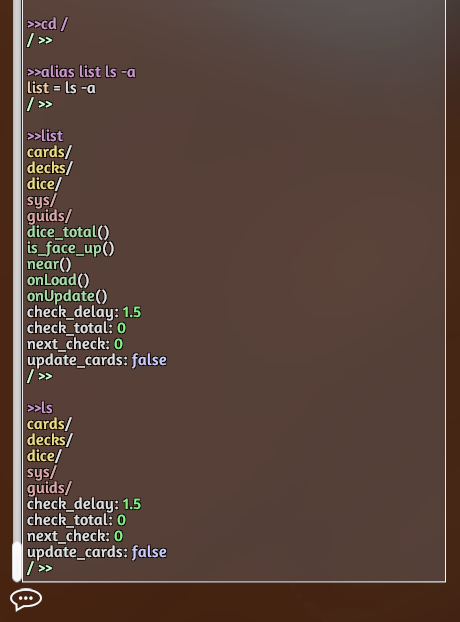 Type 'set check_delay 0.3' then select the dice and roll them. Much more responsive! If you were writing this code you could easily play with varying values for check_delay until you found the one you liked the best, and then amend the code afterwards to match. That covers the basics of manipulating variables in the run-time environment. You can see how we can use it to debug our code in a controlled manner, and also to help in refining control variables. We've now looked at simple variables and objects; next time we'll look at the third of the triad: functions. The typical cycle for debugging a game in Tabletop Simulator is to play it, wait for an error message to emerge, use that error message to find the problem, write a potential fix, then start again. This is less than ideal in a lot of ways: the error message can be a good clue for what the problem is, but sometimes it can be extremely vague (sometimes it doesn't even have a line number!). Potentially more time-consuming is that when your game is getting fairly well developed the bugs become hidden further in; it may take a lot of setup to get to the specific circumstances that trigger the bug. Typically this means that once you think you've written a fix you then need to play the game out exactly the same was as before, coordinating any playtesters to do what they did before, until the bug manifests again... or does not, and is potentially fixed - but how do you know for sure? console++ gives you live access to your mod's structure, treating it as if it were a file system. It lets you examine your variables, functions and objects, and also lets you update them, all without leaving the game. To follow along to this tutorial you need to get console++ from the link above and subscribe to the example mod on the Steam Workshop. Once you've loaded it into Tabletop Simulator, save it to your own hard disk so you can save your edits. Source code is visible here. 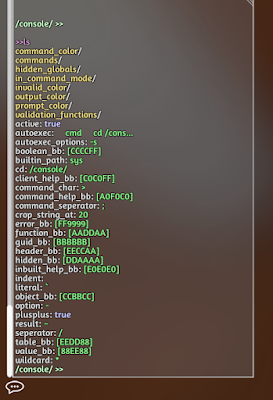 This post will cover navigating and displaying your program using the two basic commands in console++: 'ls' and 'cd'. As a quick aside, I'll be using the unix-like command names during this tutorial ('ls'), but console++ includes DOS-like alternatives, so if you prefer DOS you can use those instead. In this case, anywhere I say 'ls' you can type 'dir' instead. What does 'ls' do? 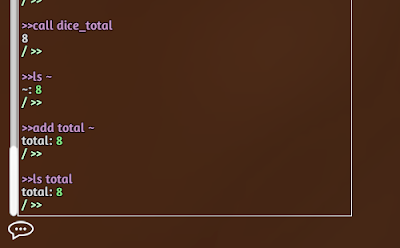 Well, we could ask for help on it, but lets do the impetuous thing and just type it into the console; make sure you are on the Game tab of the console, not the Global tab it defaults to (also it would be a good idea to hit the cog and disable autohide if you have it turned on). There are our deck objects: table entries a, b, and c. We can see their GUIDs listed next to them; right click a deck on the table and check the Scripting submenu to see it matches up. 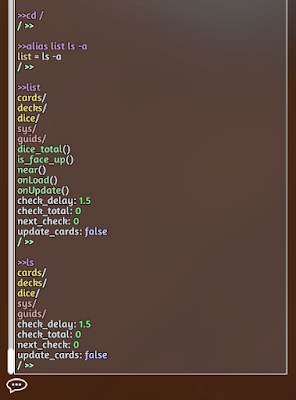 We can refer to each of these decks by their path: if you type '>ls decks/a' you'll get the listing for only deck a. 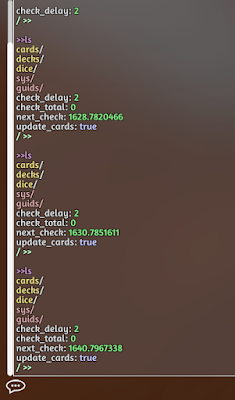 Now, if we were debugging something to do with these decks, and were going to type their names a lot it would be tedious to have to keep specifying their location. Instead we can change our current location to suit our needs, with the 'cd' command. Type '>cd decks' and then '>ls -o'. As you can see we have changed the table we are in; we can now refer to the decks simply by their letters: '>ls a'. Note that when we specify an exact path we do not need the '-o' option. Next time we'll look at actually interacting with your program by modifying variables in real time. You can #include other files into your source; when you hit Save And Play the plugin will go and grab those files and inline them in your code at the point you have placed them. The files are looked for inside the folder specified, or you can specify a complete path to their location. 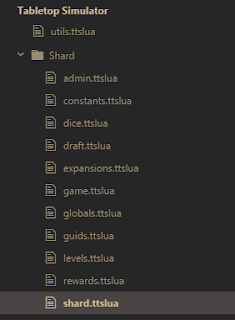 Almost all the files included by shard.ttslua are in the same folder as it, so I only need their name. Note the line: #include !/utils - the !/ is an identifier that specifies the folder specified in the package settings. 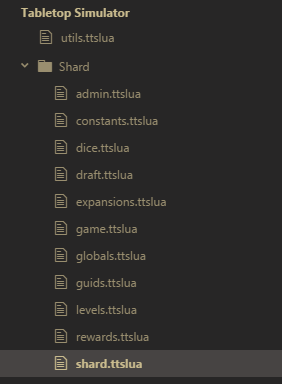 In this way I can have a utils library sitting in the root of my TTS folders, accessible by all my games. You may have a vector library you wish to include in all your objects' code; now, this is easy to do. You may also use the symbol ~/ to start a path from your user home folder (even on Windows), or specify a full path on the #include line if you want to. In practice how this works is it takes all the text in the files you are including and dumps them into the source at the point they are included. This means if you have a bunch of functions you want your objects to have access to then you can, but they are in effect being repeated in every object. As it stands this means all your modules are sharing the same namespace; a global in one is accessible in all. I'm OK with this (it's the Lua spirit), but if you want to make them behave like modules you can, you just have to do it explicitly. Start the module by declaring itself as a table. 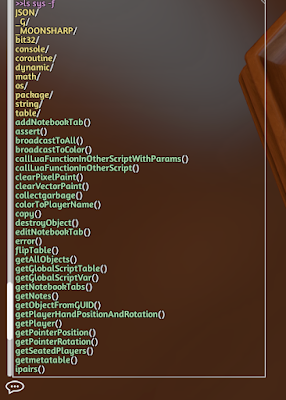 Prefix all it's "globals" and function with that table. When you get the script from TTS the atom plugin will automatically strip out the inlined code and give you what you expect. Note that the package commands like Go To Function will take into account all your includes, and when you use them will jump to the correct place. If you are in your Global.-1.ttslua file and type a line number into the Go To Function dialog it is smart enough to know which line you are referring to and take you to it. i.e. 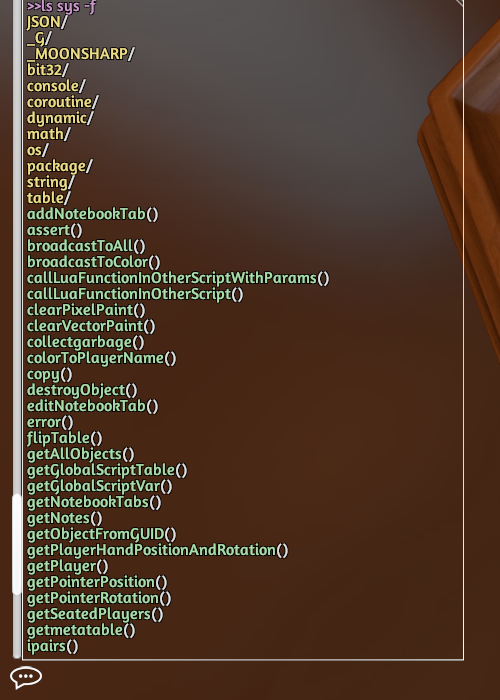 even though the program I listed at the top of this post only has 3 lines when I see it in the editor, when TTS says there's a bug on line 4345 I can hit ctrl-g and type 4345, and it will take me to the correct line (opening up the relevant included file if necessary).